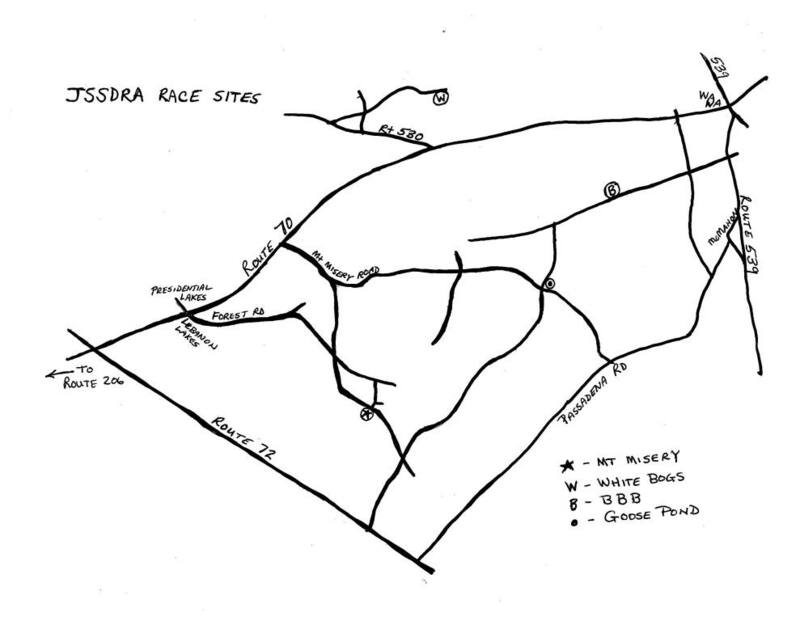 All of these race sites are within Brendan T. Byrne State Forest (formerly Lebanon State Forest) off of Rt 70. From NJ Turnpike: Take exit 7 to 206 South to 70 East and follow directions below. From 70 East (Option 1 - mostly paved roads): Follow 70 east through 206 circle to the next traffic circle at Route 72. Take the first right out of the circle for 72 south . Follow Route 72 South 6.5 miles and turn left unto Savoy Blvd. (There will be a steel train bridge just past the turn so if you go under this bridge you missed the road). Follow Savoy Blvd. that will become Pasadena Road for 4.8 miles (there will be a point on the road where you will jog left then right as you pass the Woodmansie quarry, you will also come to a stop sign where you need to turn right then immediately curve left). At mile 4.8 (from Route 72) there will be an unmarked road to the left (we may have a race sign posted here marking the turn - Mt. Misery Pasadena Road) . Turn left on this road. At about 1 tenth of a mile the paved road will turn to the left, you will need to continue straight onto the dirt road and follow the dirt road about 1.6 miles to the race site. From 70 East (Option 2 - Bumpy Dirt Roads): Continue on Route 70 East another 3.7 miles past Route 72. Turn right at the sign for Mt Misery and follow the paved road back 1.4 miles keeping left at the first Y. At mile 1.4 and the second Y you will need to bear left onto the dirt road. Follow this road 3.6 miles to the second 4 way intersection and the location of the race site. Please note that this route, while shorter, has a number of hazards on the road including soft sand, standing water, and deep pot holes. From GS and Jersey Shore via 70 West: At Route 539 ( there will be a WaWa and Exxon Sation at the corner) turn left unto Route 539 South. Follow 539 bearing right at 530/530 split for about 1 mile to McMahon Road. Bear right unto McMahon Road and continue 3.7 miles (bearing left then right) to an unmarked road on the right (we should have a race sign posted here marking the turn). Turn right onto this road. At about 1 tenth of a mile the paved road will turn to the left, you will need to continue straight onto the dirt road and follow the dirt road about 1.6 miles to the race site. From GS Parkway: Follow directions for “BBB” race site, but continue on Rt. 70 West through the Rt. 70-539 intersection. Turn right on Rt. 530. Turn right at sign for Whites Bogs Village. At stop sign, turn right and follow arrows to race site. From GS Parkway: Take exit for Rt. 70 West, to Rt. 70/ Rt. 539 intersection. (WAWA station on corner) Turn left onto Rt 539 South, bear right at 530/539 split. Go approx. 3/4 mile and turn right on sand road just past Episcopal Church. Continue on sand road about 1 1/2 mile to race site.